Sediment separators shall be Rockford Commercial Separators as manufactured by Rockford Separators, Rockford, Illinois, and as noted on plans. Furnish ______Rockford Model GSS-______ all-welded steel separators for flush-with-floor installation, ______cu. ft. static holding capacity below invert of outlet, 4" tapped inlet and outlet, four (4) 2" tapped internal vent connections, easily removable filter screen, removable 3/8" nonskid diamond treadplate cover(s) suitable for pedestrian traffic, secured with stainless steel flat head screws, extra-heavy leakproof and airtight gasket, OPEX® Shop Coat coating inside, bituminous coating outside. 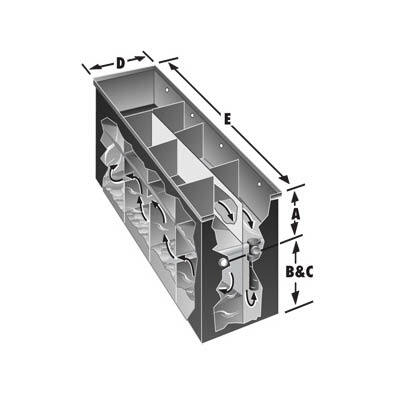 Separator cover(s) can be reinforced for installation in an area subject to vehicular traffic. * Available with 6" inlet and outlet. +Four internal vent connections are 12" C/L below cover. • Inlet and Outlet on opposite ends available.